Ready for Facebook at Work? Facebook at Work is a reality, at least for a few pilot partners, as the social network announced Wednesday that select companies can now test applications that will be made available only to them via the iTunes App Store and Google Play. 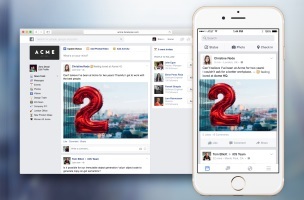 As previously reported, Facebook at Work will offer elements of the social network including News Feed, groups, messages and events, but content on Facebook at Work will be kept separate from users’ personal Facebook accounts. Note that Facebook at Work was created completely for use within a company — that means employees’ Facebook at Work info is safe, secure, confidential and completely separate from their personal Facebook profiles. The info shared among employees is only accessible to people in the company. Facebook engineering director Lars Rasmussen, who is spearheading the project, told TechCrunch the initial target audience is made up of companies with 100 or more employees, adding that it has not yet been determined how the company will try to monetize Facebook at Work, and that Facebook platform has been disabled, so ads and apps are not part of the initiative. When an employer adopts Facebook at Work, it can construct it with a set of new accounts. Users can then link their work and personal accounts together so that they are logged into both at the same time. Even if the employee chooses to link, there is no crossover. The content stays entirely within your personal or work Facebook. One feature not included in the initial version of Facebook at Work is the ability to collaboratively work on documents, but Rasmussen did not rule out adding that capability in the future. Readers: Do you think companies will embrace Facebook at Work once it is released?